Sponsor Description: The year 2003 was notable for Kooshies. In 1988, the name was spelled "KOOSHIES". This name had been successfully registered with a worldwide trademark. However, there was opposition from a company registered in the United States and over a ten-year period, without any real progress, the parties finally reached a settlement early 2003. Sam realized the solution would be to change the spelling. That year the corporate logo, labels and packaging were changed to "KUSHIES". Kushies Baby USA is now located in Niagara Falls, New York and the Stoney Creek Ontario location houses state-of-the-art manufacturing equipment and over 200 staff. A meticulous inspection standard for the ever-expanding product lines, which currently stands at over 350 baby products, ensures the continuation of the company’s high quality standards and continuing popularity. Prize description: MY BAG CONTAINS: Cool compartments for your stuff 1 insulated snack box 1 insulated medicine box 1 clean clothes bag 1 dirty clothes bag 1 soiled clothes bag with laundry bag insert 1 spare shoes bag A pillow and blanket A handy hook for hanging. Sponsor Description: The Princess’s Mom, Jodi Murphy, founded the company, Doodle & Goo, which became dedicated to creating beautiful, couture clothing for all the little princesses throughout the land! Doodle & Goo began creating custom clothing and personalized attire, made-to-order, for all those who contact them by clicking here or calling 407.267.2881. The kingdom became well-known for being beautifully dressed and for their excellent customer service and they all lived happily ever after! 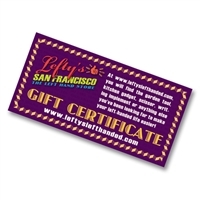 Sponsor Description: Lefty’s is the online store of Lefty’s San Francisco, which opened in 1978. They offer a wide variety of products specially designed for left-handed people, including items for the kitchen, office, school and garden. Lefty’s also has a selection of gift sets if you are looking for a great gift idea for the lefty in your life. Mandatory entry; Go to Lefty’s and tell us what you would buy with your gift card. Mandatory entry: Visit Doodle and Goo and come back and leave a comment saying what you think is cute. Mandatory entry: Visit kushies and tell us which shoes you would pick out!